Today is August 1st and it’s a perfect day. The sun is shining, it’s 77 degrees outside. I’m pretty sure that every year on August 1st the weather is glorious. 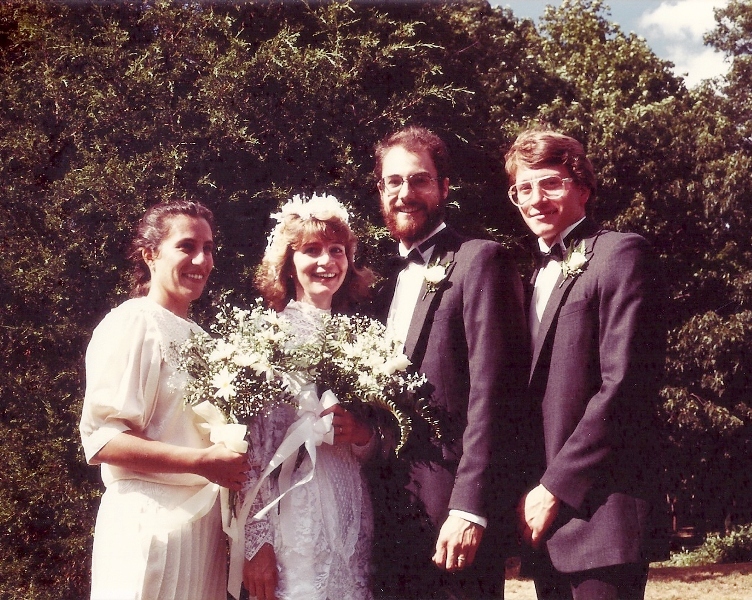 I know for certain that it was twenty-five years ago, which is why I chose that day to marry the love of my life. It was 1987 and we were busy. LOML and I were building a house with the help of a few family members and friends. I was an art major at URI and had the summer off. LOML worked second shift at Electric Boat. We were on a very tight budget. When we decided to marry, a fellow art student offered her back yard with its apple trees and pastoral setting. 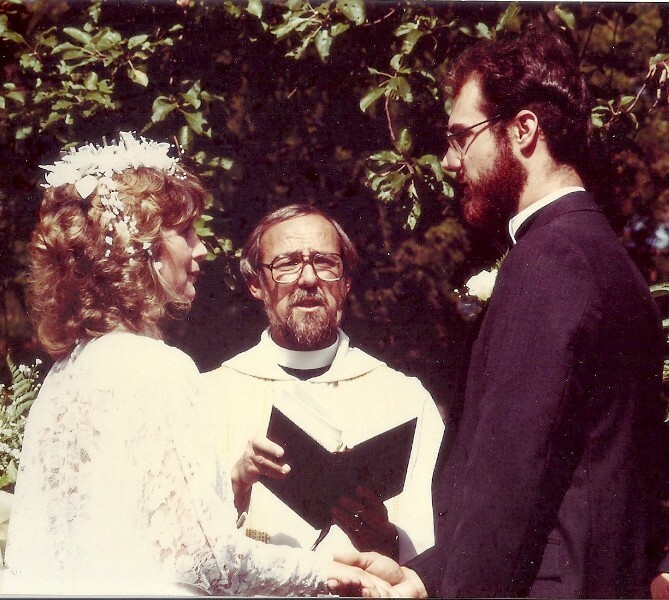 Another art student friend offered the use of her husband, an Episcopal priest, to perform the ceremony. My siblings arrived from various parts of the country and helped prepare food for the reception. My brother Tom, who had worked in the restaurant at a New Hampshire resort, awed us with his skill at carving veggies into decorative shapes. Our biggest splurge that day was the string quartet I hired to sit under the apple trees and serenade us. It was bliss. We have marked the day in many ways since 1987. On our first anniversary I was pregnant with our son. For our twentieth we spent the night in the same room of the same Providence hotel where we spent our wedding night. Last year we did a segway tour of Newport. This year we’re going to wing it. Just get in the car and head towards Providence and do wherever we fancy. The only real plan is to end the evening with dinner at our favorite Newport restaurant – Yesterday’s. We’re not big on gift-giving for our anniversary. We already have what we’re happy with and would rather save the money for our yearly Fforde Ffiesta/England trip. And that, indeed, has made all the difference. LOML and I saying, By Gosh, YES! we certainly do!! LOML, moi, my Maid of Honor, & my brother, who was the Best Man.